When it comes to money, taking a chance is a funny thing. Big risk means big reward, but big reward for little to no risk is the ideal situation. Unless your plan is to hide your savings in your mattress, a bit of risk is reality. Thankfully, technology is helping change that reality so your business can achieve more. Indian consulting and business solutions company Tata Consultancy Services (TCS) is committed to providing big picture insight to enterprises. The more data available and processed, the better the insight. That’s where TCS’s high-performance financial risk estimation application comes in. The application calculates Incremental Risk Charge, which is an essential part of understanding credit risk estimation. By doing so, TCS’s customers can achieve an advantage over the competition with faster, more accurate insights. But it’s not that simple. The application is data intensive and uses a ton of compute resources, which has the potential to slow things down. With extra cores, a larger cache, and support for faster memory in the Intel Xeon E5-2697 v4 — compared to the previous generation processor — TCS’s data-intensive risk estimation application is able to leverage additional compute resources. By also leveraging Intel® Software Tools such as Intel® Math Kernel Library and Intel® VTune, they delivered up to a 46 percent performance gain. This translates to increased throughput of critical computations for better, faster financial risk estimation. 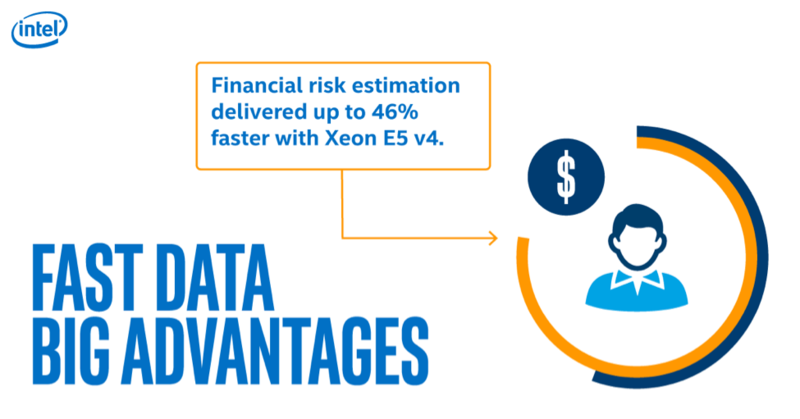 Don’t let risk stand in the way of reward — minimize it via faster computing with Xeon® E5 v4. Learn how the Intel® Xeon® E5-2600 v4 Product Family can deliver resource utilization efficiency, process faster transactions, and boost uptime and availability for financial applications to help create scalable systems for large workloads.